The 'Barcelona Haggadah' was made in Catalonia during the second half of the 14th century. A Haggadah is a collection of Jewish prayers and religious readings written to accompany the 'seder, a ritual meal eaten on the eve of the Passover Festival, which commemorates the delivery of the Jews from slavery in Egypt. 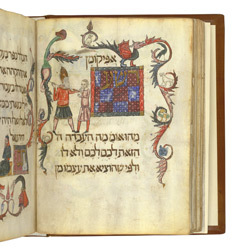 This folio shows the wicked son, one of the Four Sons mentioned in the Haggadah. In medieval Haggadah manuscripts he is often depicted as an armed, fierce soldier, as seen here. Nearly all pages in the 'Barcelona Haggadah' are illustrated. Particularly striking are the intricate foliage scrolls that adorn its pages.